Controversies continue to revolve around Kangana Ranaut’s ‘Manikarnika: The Queen of Jhansi’. Also, the verbal spat between Kangana Ranaut, Sonu Sood and director Krish seems to not end anytime soon. In recent times, Kangana has also targeted Alia Bhatt, Deepika Padukone and others for not supporting her film ‘Manikarnika’. While Alia has decided to give a personal apology to Kangana, others have chosen to keep quiet on the topic. 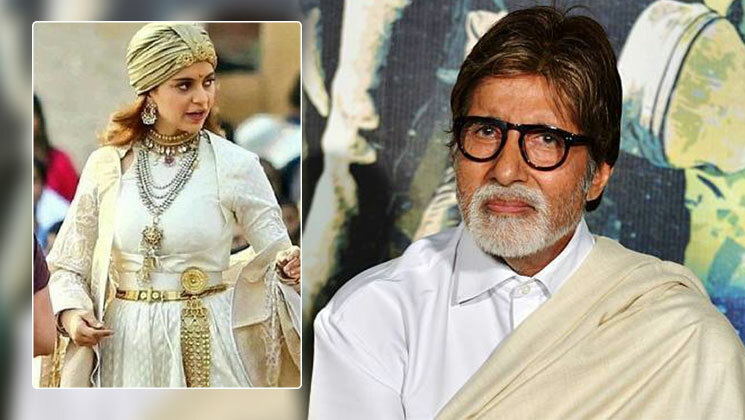 Also, Megastar Amitabh Bachchan avoided talking on the ongoing controversy surrounding Kangana Ranaut’s ‘Manikarnika: The Queen of Jhansi’. Notably, on February 7, Senior Bachchan went for a book launch but no media conference was held post the event. However, this is not the first time when Amitabh Bachchan ignored speaking about the controversial issues related to Bollywood. Previously, he had refused to speak on the Tanushree Dutta – Nana Patekar debate revolving around the #MeToo movement. On the work front, Amitabh Bachchan was last seen in the film ‘Thugs of Hindostan’ which also starred Aamir Khan, Fatima Sana Sheikh and Katrina Kaif in pivotal roles. The film, which was produced by Aditya Chopra, received negative reviews from the audience as well as the critics. But, Amitabh Bachchan and Aamir Khan were praised for their brilliant acting performances. Big B will be next seen in the upcoming fantasy film ‘Brahmastra’ which co-stars Ranbir Kapoor, Alia Bhatt, Mouni Roy, Akkineni Nagarjuna, Dimple Kapadia and Divyendu Sharma in the lead roles. ‘Brahmastra’ is produced by Karan Johar and directed by Ayan Mukerji. It has already been announced that the film is going to be a trilogy and the first part will hit screens this Christmas.